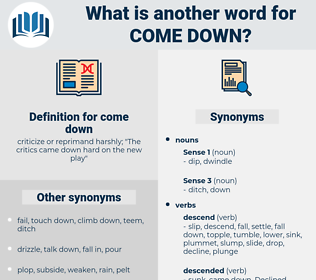 What is another word for come down? 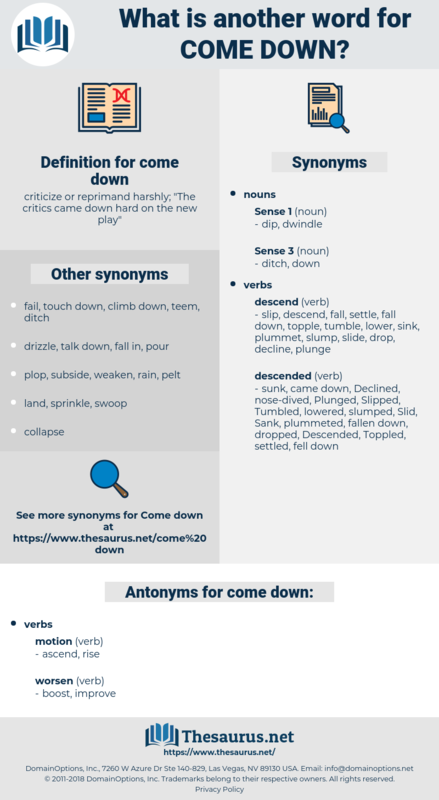 criticize or reprimand harshly; " The critics came down hard on the new play"
cascade, dismount, plunge, tumble, go under, drip, unhorse, drop, alight, roll down, cascade down, slump, plop, plunk, get off, light, abseil, pitch, correct, pounce, rappel, set, precipitate, avalanche, settle, get down, swoop, prolapse, climb down, rope down, topple, sink, go down, flop, crash, dive, subside, decline. rain, spat, rain down, snow, sleet, hail. criticise, pick apart, criticize, knock.